Thousands of young players around the world enjoy representing Liverpool through LFC International Academy programmes each year, but last week two teams visited the city and experienced Anfield first-hand for themselves. Two separate trips saw LFC International Academy teams from both UAE and Japan visit Merseyside for the first time, a trip that is sure to have created lasting memories for both groups. The team from LFC International Academy UAE spent time in the city for a couple of days prior to enrolling on an LFC Soccer School at the Club’s Academy. Meanwhile, players from Japan enjoyed the experience of a training session at Liverpool’s own Academy in Kirkby under the expert guidance of LFC International Academy coaches. Another highlight for both groups were trips to Anfield, where they enjoyed a tour of the stadium and museum, taking back memories that will last a lifetime. “The LFC International Academy is all about taking the club to our young fans around the world. We’re fortunate to be able to offer an authentic LFC youth coaching experience to players on our projects which span from the west coast of America to the east of Australia, it’s truly a global offering. 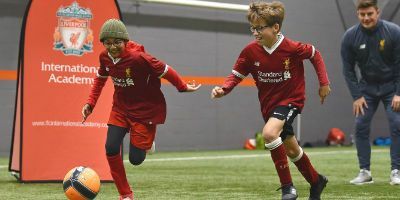 If you want to find out more about LFC International Academy, their global programmes and the Soccer Schools that are hosted at LFC’s Academy in Kirkby during school holidays, visit the UK Courses page.